BlackBerry 8700g Wireless Handheld is a Intel XScale processor device that supports various BlackBerry functionality including push e-mail, email, mobile telephone, text messaging (SMS and MMS), internet faxing, web browsing and organizer applications such as address book, calendar, memo pad, tasks, and other wireless information services. All services was delivered over the high speed wireless data networks of cellular phone companies. 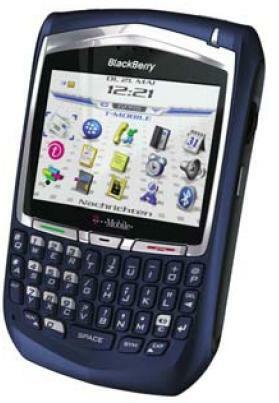 BlackBerry 8700g features integrated attachment viewing for popular file formats, bright high-resolution screen, built-in speakerphone, supports Bluetooth hands-free headset and car kit, support polyphonic and MP3 ring tones assign to contacts, has full ergonomic QWERTY keyboard, 64 MB of memory and Quad-Band network support on 850/900/1800/1900 MHz GSM/GPRS and EDGE networks. NetworkWorld reviews BlackBerry 8700g and concludes that e-mail options are what you’d expect from a BlackBerry – you can grab e-mail from a BlackBerry Enterprise Server attached to an Exchange (or Lotus Notes) server, or you can use the desktop redirector software and forward Outlook e-mails to the device (but you have to leave your computer powered on for this option). Internet e-mail accounts (Yahoo, Gmail, etc.) are also supported, letting you have one device for multiple e-mail accounts. The phone service worked fine, whether a regular call or in speaker phone mode. The Web access and browser was what we expected, sort of a ‘meh’ experience, but useful in a pinch. The main purpose of this device is to receive e-mail, and this it did admirably. ComputerAct!ve (dead link) reviews 8700g and concludes with rating of 3 out of 5 that BlackBerry 8700g has the good points of solid build quality, crisp display and good keyboard plus able to collects email automatically, while the bad points are expensive compared with other handsets and price plans and keyboard not great for those with two left thumbs. Overall, it’s a great device but shame about the exorbitant cost and lack of POP email support. TopTechNews (dead link) concludes with rating of 4 out of 5 that BlackBerry 8700g which is available from T-Mobile for $299.99 after rebate, is an enterprise-class handset that is more than up to the task of fulfilling the needs of most mobile workers. However, those who like to access Wi-Fi hotspots while on the go should consider the purchase of T-Mobile’s MDA smartphone. TrustedReviews (dead link) concludes with overall rating of 8 out of 10 that BlackBerry 8700 is the most accomplished handset that RIM has produced to date, but it finds itself balancing between two camps. On one hand it wants to be a heavy duty corporate tool, but on another it offers great features and value for money for the small businesses and individuals. I still firmly believe that there is room for two BlackBerry models – a corporate unit and a more consumer focused version, complete with camera, full Bluetooth functionality and even Wi-Fi. As it stands though, the 8700 is the best option if you need your email sent to your pocket.